Skin-Prep is a liquid film-forming dressing that forms a protective film to help reduce friction during removal of tapes and films. Skin-Prep can also be used to prepare skin attachment sites for drainage tubes, external catheters, surrounding ostomy sites and adhesive dressings. Helps tape and film adhesion. Skin Prep wipes are fast and easy to use, only one coat is required, so less product is used per application. Removes easily using skin cleanser or soap and water, so unsanitary residue isn’t left in or around the wound area. Skin Prep applies easily, even on awkward areas and moves naturally with patients’ skin and won’t crack or peel. Best of all, the Skin Prep wipes allow your skin to "breathe" so tapes and films adhere better. The wipes may increase intervals between dressing changes. The Protective Dressing helps to increase the adhesion of tapes and wafers. The Skin Prep also protects fragile skin and reduces adhesive removal trauma. These are the best in my experience because they are large enough to hold onto. Binds the tape & adhesive. Binds the tape & adhesive. Binds the tape & adhesive. Binds the tape & adhesive. Average Health. surgery patient . sensitive skin. Diabetic. I had wound care treatment under my armpits for nearly three months. This product saved my skin and my sanity between dressing changes. I strongly recommend that you also use the unisolve pads with this product. They work hand in hand. low price and very effective. Creates sticky surface, dries fast and doesn't leave a residue. I agree with Robin from New Orleans. My husband and I are both allergic to latex and neither of us has had any problem with this product. If I were you though, I would call the customer service number and ask for sure. We use IV prep prior to diabetic pump insertion site will the skin prep protective-barrier work the same? I use Skin-Prep Protective Wipes as a skin protector only. The moisture in the wipe seems to protect the skin when it dries. I don't think they are. I have the same reaction to them that I have to bandaids or "me-fix" adhesive. It is a rash that will break down the skin to bleeding after a week of use. My daughter is highly allergic to latex. She has used these wipes with no problems. I would suggest that you call the 1-800 number for cusotmer service to check for sure. How do clean scissors used to open packets of skin prep? They stick together after a few uses. Have you tried alcohol? That should work, especially if you wipe the scissors after each use. I haven't had this problem because I simply tear the packets open at the notch on the side of the packet. I don't use scissors to open the packets. I just tear them open. I think alcohol works fine to clean scissors. No need to use a scissors. I just tear them at the notch. They open easily. Goo Gone will work removing adhesive. I have used it on scissors and it works well. I would use Goo-Gone until the scissors are clean and then, use alcohol on them until the Goo-Gone has been cleaned off the scissors. Then, in order to sharpen the scissors, take a piece of aluminum foil and cut it many, many times until the scissors are sharp again. Will this help with healing of small wound that is the beginning of a bed sore on the tailbone? No, this is for SKIN around a wound prep. Don't use it on wound. As I understood, you have situation with small bed sore on the tailbone. If it's correct, you need to develop a plan for position change at least every 1-2 hours. In addition, you might want to try to apply a bit of Calmoseptine Skin Ointment on the wound. If it's just beggining, Colmoseptine works perfectly! 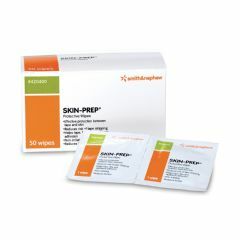 I use skin prep to protect the skin around a wound. However, I never used skin prep directly on a small bed sore or wound. I am a real fan of Calcium Alginate by Kendall also known as Curasorb if the skin is broken. Ask any wound care doctor. I am not a medical person. However, my husband has been wheel chair bound since 1992 and has never had a bed sore on his tail bone. He did, however, have an open sore on his knee from a bump and the calcium alginate put directly on the open wound and covered with a dressing healed that in no time flat. To protect my husband's tail bone as he sits for 12 hours a day in the chair, I put skin prep around the perimeter of the tail bone area, then apply a small dressing which I put over his tail bone to protect him from the material in the underwear from constant irritation due to rubbing or movement. For this I use Kendall Telfa Mini Island Dressing. Item #7539LF or these numbers also on dressing 101153/963506. I get all of the products mentioned from Allegra Medical. Hope this helps a little. I've used this on my Mother and she said it burned. Not on their own. These prepare the skin so other dressings adhere better. The purpose of these wipes is to protect your skin from adhesives. I think it would be a bad idea to use them to treat a bed sore. From my experience, Skin Prep applied to a sore or rash causes extreme burning. I use Skin Prep as an adhesive for an ostomy wafer. No, no, no! Don't use this product on an open wound. Go see a wound care doctor or infectious disease right away. Use a 4 X 4 soaked in saline solution until you see doctor. NO! See doctor, preferably a wound care specialist, for wound care. NEVER use Skin Prep on a wound! Will these work with a tens unit? I don't know. I use them as preparation for using CPAP mask to protect the skin from irritation. I imagine that it would work for a TENS also, but don't really know. the product does clean the skin as you wipe it, but it puts a small "adhesive" on your skin as well. it is for better contact between your skin and another sticky material. I don't know why these would not work for a TENS unit, but I am not positive. I use them when I change the catheter holder on my husband's thigh. The product is used to clean the oil from the skin and leave a slightly sticky layer to better adhere any self-adhesive product to the skin. Works great with TENS unit.